Nathan is a real kid with a real problem – he hates to read. I first started working with him almost three years ago when he was in fifth grade. He wouldn’t pick up a book unless forced to by his parents or teachers. It was a different story with videos. He went through those like dessert. Nathan will be a ninth grader in August – New teachers, new setting, but without the same troubles in reading. Yes, there has been a breakthrough with Nathan. To educators everywhere… Don’t give up on those frustrating kids even when there are no more techniques or answers in your bag of tricks. I’d like to say I found the magic potion to turn Nathan around, but he found it all by himself. Perhaps he had tired of my “you’re going to love this book” spiel. I kept telling his parents that some day Nathan would get a love of reading. It just took longer than most. During my first year with Nathan, parents had his eyes tested to make sure there wasn’t a tracking problem (none), had a full battery of tests completed (Hi IQ with a non-verbal strength.) I kept digging trying to find the book that he might finish: Diary of a Wimpy Kid diary type books, animal stories, mysteries, Choose your own Adventure, and books on tape he could follow along with his text copy. Week after week there would be a new try and nothing worked. He’d read a chapter or two and then toss the book aside. This week I was revisiting humor books with him. He lives in my neighborhood and this almost 15-year-old sat there with a smug look on his face as we read passages of a book I won’t name. I’m sure others would be laughing out loud at its content. We didn’t get far before he stopped reading. I pointed two feet away from his own feet at a dark fully loaded backpack sitting on the floor. Yes, he’s rather scattered in his thoughts and he’s a teenager. Enough said. “Is that yours?” I asked. That was supposed to be my line. I might have fallen on the floor at this point if I hadn’t been gripping the table in front of me. So he reaches in and pulls this book out. I clutched my chest when I saw the book mark positioned two-thirds into this story. He’d discovered something he likes. Fortunately it’s a series and may connect him to other books written in the same way or numerous others by the same author. Perfect. It’s one I missed sharing but Nathan found. Of course this post would not be complete unless I shared this book title with you in hopes it might inspire one of your reluctant readers. 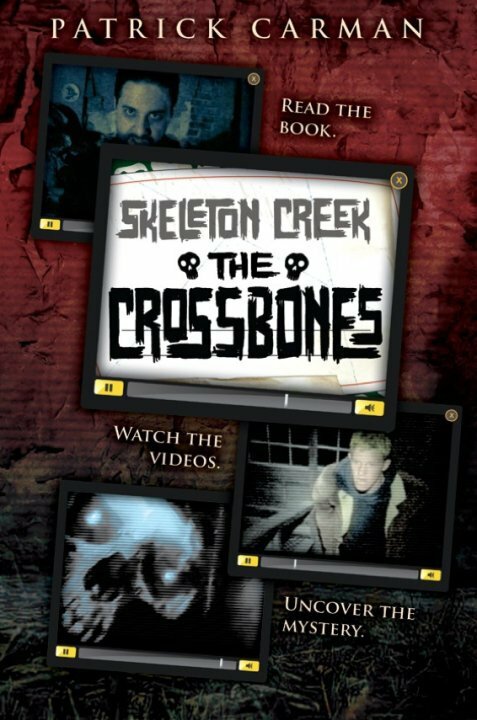 It’s Patrick Carman’s Skeleton Creek series, all written in journal format. America, we have a new reader. This entry was posted in Reading and tagged Middle grade, Patrick Carman, Reluctant readers, Skeleton Creek Series. Bookmark the permalink. 3 cheers for Nathan and perseverance. What a great story. I was really interested in his comment that the lines have extra space. I was able to look at the book on Amazon. It is a cool font and there is a lot of white space on each page. The type is large. This does not look daunting. How smart of the designer to do this. I think blocks of tight type are so hard for kids to see and be inspired to read. Thanks for this post. So interesting. And congrats to Nathan and for you for your perseverance. Nathan once told me book pages were too crowded. I didn’t know until now he meant the space between the lines. I’m going to try this same book on a few other reluctant readers and see if it’s the same result.